"The field of medical genetics has grown by leaps and bounds in the past few decades. This global trend is mirrored in the Arab World in the increased importance being afforded to genetic disorders and their mitigation in the region, especially since the beginning of this millennium. It is to the advantage of geneticists in the region that several international organizations, including the Human Genome Organisation (HUGO), are now taking an active interest in the genetics of emerging countries. In 2004, the Centre for Arab Genomic Studies (CAGS) published its first comprehensive book on ‘Genetic Disorders in the Arab World’. 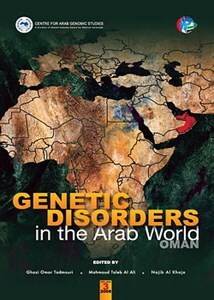 Although this book touched on genetic disorders in the entire region, it focused on the spectrum of genetic disorders within the United Arab Emirates. Two years later, a similar book, but with results specifically pertaining to the Kingdom of Bahrain was brought out by the Centre. It is with great pride that I now present the third book in this series, which comes at the end of an intensive data collection and curation process for the Catalogue for Transmission Genetics in Arabs (CTGA) database from the Sultanate of Oman. I would like to mention at this point that with each completed project of the CTGA database, modifications are made to the data collection and curation methodologies. With the Omani project, for the first time, CAGS applied the strategy of having an on-site research assistant stationed in Muscat and working on the database. This was one of the main reasons for the timely completion of the Omani effort, especially considering the volume of work involved in this country. The completion of the Omani project also means that we are now in a position to actively compare data from the three states of the South Eastern Arabian Peninsula, i.e., Bahrain, Oman, and the UAE. Preliminary results of such comparative studies are also presented in this book. With the completion of the Omani project, the CTGA Database Team has now initiated new projects of data collection in other Arab countries. We hope that in a short while, we will be able to present you with results from the State of Qatar. The publication of this book would not have been possible without the support of H.H. Sheikh Hamdan Bin Rashid Al Maktoum, Deputy Ruler of Dubai and UAE Minister of Finance, who first envisioned the Centre and whose constant encouragement has been a source of great inspiration for all those working at CAGS. I would also like to place on record my appreciation for the members of the Executive Board and the Arab Council of CAGS, especially Dr. Anna Rajab and Prof. Riad Bayoumi, for their contributions to and critical appraisal of this book. We have tried our best to present a book which captures the essence of genetic studies in the region, and I hope that medical and genetic researchers will find it useful in their studies."